I'm not going to lie, one of the first things I thought of on discovering I was expecting a baby was getting stuck into designing the nursery! So now that we've only got a few months to go before the big arrival, its finally time to start thinking about putting my ideas into action. I've been busy pinning some ideas over on my Nursery board on Pinterest, and have decided to go with a grey and white scheme, seeing as we won't be finding out the gender. How stunning are all these rooms?! I've fallen in love with the idea of using cloud-themed accessories, and want to include fairy lights and clever storage solutions throughout the room too, as space will definitely be an issue. The baby will be having our smallest spare room, and as you can see from my recent Home Office Makeover (very sad to be seeing my sewing area go, I must admit! ), space is fairly tight, so it's definitely going to need some creative planning when it comes to fitting everything in. 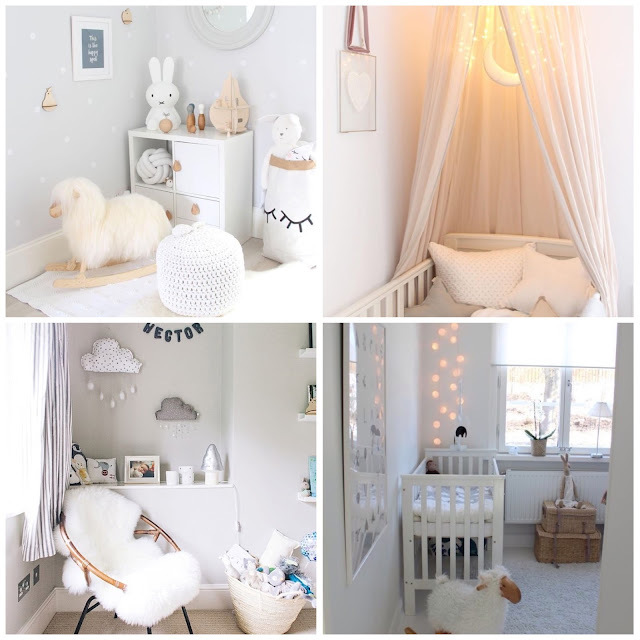 We'll also be transforming this room on quite a tight budget (there seems to be so many things you need to buy when expecting a baby! ), so I will be re-using a number of items I already own, such as the blind/curtains already in there, and making a few accessories too. 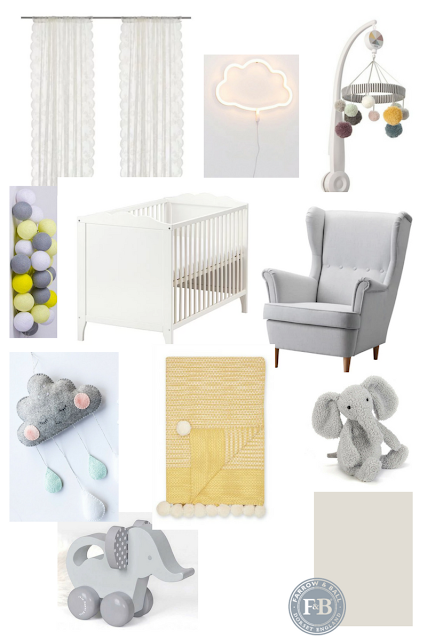 I'm particularly excited about that pom pom throw - doesn't it look perfect for those middle of the night feeds?! We'll be getting started on this room very soon, so will keep you updated about how we get on. Do you have any tips on what you definitely do and don't need when planning for your first baby? So many sweet ideas! I love the pom pom throw and mobile! Thank you! The throw is top of my list! I love your cloud theme and fairy lights! I'd also like to add my 2 cents about planning - you don't need nearly as much stuff as everyone would have you believe. I didn't want to buy a piece of furniture (changing table) that only had one purpose. I changed my baby on a plastic mat on the bed - no problem, ever. Just keep one hand on him/her at all times. A million wipes and a diaper genie are the most important things. Also loads of cheap onesies (oh but they stain quick!) and a nice blanket (love the pom poms). Also, my mom got me an expensive "glider" - I hated it and nursed on the couch, which was very comfortable. But I'm sure every mom has their own opinions on all these things! Don't even get me started on baby clothes with buttons... or nursing bras. Good luck and congratulations! Thank you! Yes, I'm sure I don't need half the things I think I do, so this is all good to know!